Unconventional housing in Texas is not in short supply. Texas people enjoy doing their own thing there, and that is evident in the homes. A population boom has created a building boom, and most are contemporary, traditional — aka ‘boring’ — houses. Then there are the one-of-a-kind, from boathouses to off-the-grid shipping container homes. Anyone seeking a move to the Lone Star state should visit these Texas homes for sale for inspiration. Barndominium is an impressive barn-like conversion. The architects kept the original barn shape, but everything else inside was transformed. From the recycled denim insulation to rain screens, each aspect was designed with efficiency in mind. This large, unconventional home is located on Dallas’ White Rock Lake. Constructed from 14 shipping containers, the 3,700 square foot home features floor-to-ceiling windows and a 1,400 square foot rooftop deck. One of the most unique homes in Texas is the Bercy Chen Boathouse on Lake Austin. Cylindrical and hovering over the water, the home features a built-in waterfall cascading from the upper floor patio to the lake. Featuring a 360-degree view of the lake, the home’s curves make the structure an eye-catching sight. This may be the most famous house in Texas — it looks more like a spaceship than a house. Made of steel which has rusted to a burnt orange, the home was designed by Robert Bruno, a frustrated sculptor. Twenty-three years and 110 tons of steel were consumed to build the structure, which ‘hovers’ over the ground. 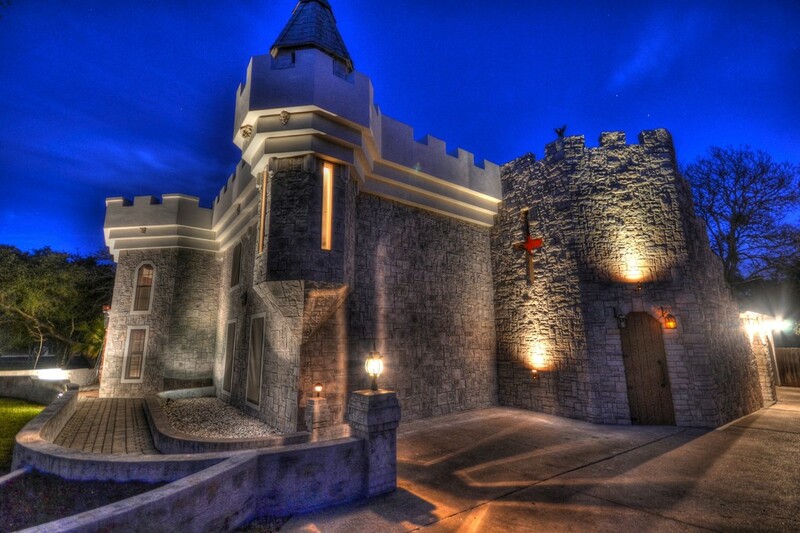 Northwest of downtown, the Austin Castle House is medieval on the outside but thoroughly modern on the inside. The game room has a retractable roof, and the home has steadily been renovated since constructed in 1975. Everyone dreamed of living in a treehouse when they were a child. Jimmy and Sandy Martin turned their shared dream into a reality. The 75,000 lb home sits in a group of three trees. The exterior is traditional for Texas — metal roof and wood siding. But inside the treehouse, visitors find all the creature comforts, including a full kitchen and bathroom. The city’s most off-the-wall house is underground — built into a hill so that one side gets natural light, while the other side is hidden. Beneath the hill is a big 4,500 square foot home which stays cool in spite of the Texas heat. When it gets cold in the winter, there are three fireplaces to keep the space warm. The house went on sale in 2013 for just over $1 million, and was designed by Frank Mooreland.